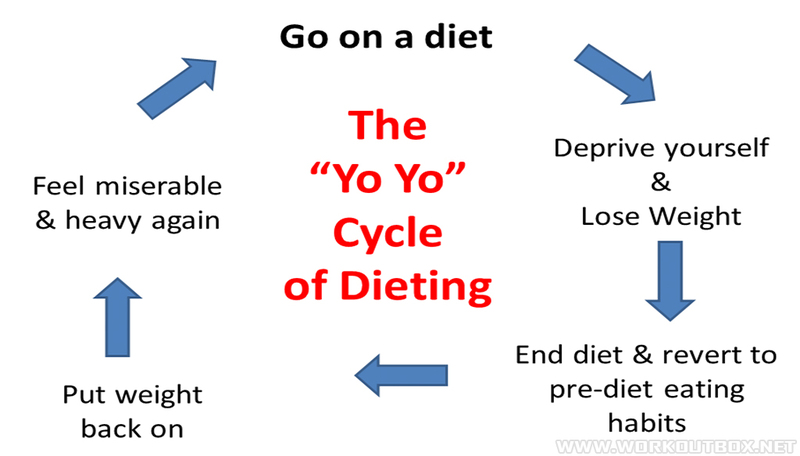 Yo-yo dieting or yo-yo effect, also known as weight cycling, is a term “yo-yo dieting” coined by Kelly D. Brownell at Yale University, in reference to the cyclical loss and gain of weight, resembling the up-down motion of a yo-yo. In this process, the dieter is initially successful in the pursuit of weight loss but is unsuccessful in maintaining the loss long-term and begins to gain the weight back. The dieter then seeks to lose the regained weight, and the cycle begins again. A comprehensive review of the science on weight cycling was completed by a group of obesity experts who were convened as a national task force to address the issue. They concluded that reliable evidence does not demonstrate that weight cycling decreases metabolism. In other words, repeatedly losing and regaining body weight does not make it harder to lose weight when trying to do so the next time around. Weight cycling also has not been linked to an increase in body fat or accumulating fat around the middle, which is linked to increased health risks. So after a weight cycle, those who return to their original weight have the same amount of body fat and muscle mass as they did prior to weight cycling. More recently, while weight cyclers were found to be heavier and have a less favorable metabolic profile, they were able to lose weight and experience improvements in metabolic measures. While many studies have found no relationship, some have shown a link between weight cycling and increased health risks such as hypertension, high cholesterol levels, and gallbladder disease. Among a group of older adults, weight cycling was associated with difficulties with activities of daily living and limitations in mobility. Intentional weight cycling does not appear to increase mortality, although age at the time of weight gain or loss may have an effect. Repeatedly losing and gaining weight may be detrimental to psychological health. Some studies link weight cycling to increased measures of psychological distress, life dissatisfaction, reduced levels of self-efficacy., and lower quality of life. Female African-American weight cyclers demonstrated a greater desire to be thin, less satisfaction with their body, and lower self-esteem related to appearance. Additional well-designed research clearly is needed before any firm conclusions can be drawn. Frequently losing and gaining weight is not the recommended way to maintain a healthy weight and achieve a healthy lifestyle. However, the health benefits of weight loss greatly outweigh the potential drawbacks of weight cycling and should not be used as a reason to avoid weight loss. Long-term lifestyle modification is the key to preventing weight cycling and keeping the weight off for good.